Over twenty years ago when I started my career in mental health, it was rare to have psychotherapy sessions that involved hearing patients’ concerns about tsunamis, hurricanes, storms, and tornados. Today, more people are talking about climate change and its devastating impact on their lives or their loved ones. Many patients have shared with me how watching the horrible images of weather related catastrophes on the news have made them feel sad for the victims and worried about the future of the planet. I share their concerns as well. I am also deeply saddened about the mistreatment of the planet and exploitation of its natural resources which has contributed to the problem of climate change. I understand there are many reasons why we are experiencing more weather related catastrophes including the greenhouse effect which adds to the concentration of carbon dioxide in the Earth's atmosphere. Since not enough work is being done to protect the planet from global warming, we all need to get ready for an unknown future. In psychotherapy, the concept of dealing with the future and its unknown reality comes up often. We don’t know what the future will bring, but we can learn how to accept change as part of the human existence and have enough humility to learn from it. Many politicians and policy makers who don’t believe in the science of climate change often deny the fact that the frequency and severity of recent extreme weather events is caused by it. We are being warned by many scientists that life as we know it today is changing. Those of us who listen and hear the cry of the Earth cannot ignore the pain that has been inflicted on the planet by greed driven consumerism. Many of us grieve along with the planet and do what we can to help. No one can predict with certainty what ten years from now is going to look like. There are scientists who believe we are passed the tipping point. Those of us who love and respect the Earth and witness its torment can ask for divine intervention. In a hopeless situation we can look for the light of Truth. Humanity cannot solve the problem of climate change with the same consciousness that created it. We as people need to look deep within our own hearts and look for a new light that can guide us out of such impending doom of climate change. As long as we are distracted by our personal problems, we won’t be able to hear the cry of the Earth. The new born babies deserve a better future, and we owe it to them to make that happen. 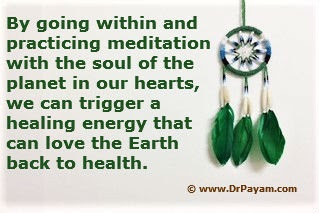 As the unknown future with climate change unfolds, let’s keep the Earth in our heart during meditation. I hope going within and practicing meditation based on love and kindness with the soul of the planet in our awareness can trigger an awakening of a new healing energy that might provide a brighter future.